Here’s my mom’s recipe for Kerala style vegetable curry with coconut milk. Hope you enjoy it as much as we did..
1. Heat coconut oil in a heavy-bottomed vessel. Splutter mustard seeds and fry dried red chilies. Add onion, little salt, ginger, garlic, green chilies and curry leaves. Saute until onion turns translucent. 2. Add potato cubes and stir for 1 minute. Add beans and carrot. Cook for 1 – 2 minutes. Next add cauliflower pieces. Mix well and cook for a few minutes. Add the spice powders. Mix well. Add thin coconut milk. Mix well. Bring to a boil. Taste-check for salt. Cook covered at medium-low heat for about 10 – 15 minutes until gravy is slightly thick and vegetables are done. Add thick coconut milk. Cook for a minute and switch off. Set aside for 10 minutes. 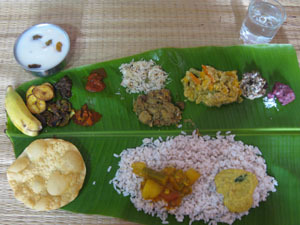 Serve with appam/ idiyappam/ chapathi.